Remember…Dr. Martin Luther King, Jr.
Hola! Happy Martin Luther King, Jr. Day! Today is a day to remember a great man who worked and fought hard for the freedom of all men and women regardless of color. 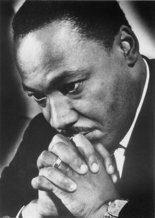 We all need to thank God for allowing Dr. King to have spent the time that he did on this earth. If it wasn’t for his determination and love for mankind then our lives today would be totally different. So please today remember, give thanks, and keep his legacy alive!